New Year Pain Free - Synergy Spinecare & Rehabilitation Medicine, P.C. 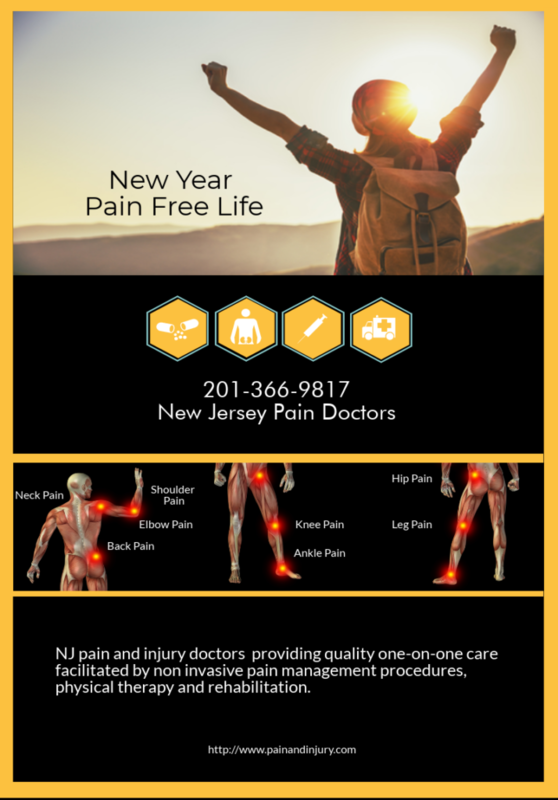 2018 resolutions to a pain free life is achievable according to Synergy Spincare & Rehabilitation in New Jersey. Setting some healthy goals can lead to a happier, healthier New Year, pain-free you. Come out of the shadows. Surround yourself with people that will understand and support you as you strive for a better quality of life. Healthy relationships whether family, friends members, support groups can help you feel good. Feeling good allows you to relax, and reach out the individuals in your life — no longer feeling alone and isolated. Start thinking positive. I am going to get healthy. Focus on the New Year being a pain free year. Create your own mantra. Repeat after me “New me, pain free. New me, pain free. New me pain free.” Keep a journal listing positive things that happen in your day. Condition yourself to focus on the good — there is no bad. You had a good day. You worked out. You spent time with family, friends, enjoyed a a good movie. Condition yourself to look at the positive and only the positive. Weight-loss makes a difference. It a well known fact that staying healthy includes maintaining a healthy weight. We’ve heard it all before.. “this year I will lose 25 pound”. Set yourself some healthy achievable goals. Rather then 25 pounds, in your journal, shoot for 5 pounds. Set some accomplish-able goals. Drink lots of water, take walks for 15 to 20 minutes, eat a healthy diet. Once you’ve accomplished these simple chores the next step will seem so much easier — and then boom before you even know it you’ll start dropping pounds and feeling better. Stop Smoking. Break those addictive habits. Smoking worsens your chronic pain. Smoking has been known to cause insomnia, stress, or nutritional deficiencies. Smoking has been associated with shoulder pain and injuries (like rotator cuff tears). Get some sleep. Your body needs rest. Cut back on caffeine. Take a walk before bedtime. Turn the lights out. Eliminate distractions like being on your phone or watching the TV. Close your eyes and clear your mind. You really want to sleep, you just need to put some healthy just before bed patterns to allow your body and mind to relax. Finding the right doctor that will will listen to your concerns can help your mental state of mind. A healthy mind allows an individual to see the light at the end of the tunnel. This year consider seeing a pain management specialist for chronic pain relief. You’ll be introduced to innovative treatment options for chronic pain conditions. Make 2018 the year of a healthier, happier, more pain-free you.